Giannino In San Lorenzo is a restaurant in Florence that offers the best service and the most precious quality of ingredients. Our goal has always been to represent Florence and Tuscany, emphasizing its best culinary qualities. We created this section to introduce our most famous dishes and illustrate the recipes step by step so you can replicate them at home. At our restaurant you can find a variety dishes, all inspired from by the authentic Tuscan tradition: rustic and country-side dishes like “ribollita”, the Florentine tripe; but also important dishes, well-known all over the world, such as Florentine steak. Giannino has a lot to offer to its guests, in addition to hospitality and exceptional quality. We are a restaurant in Florence that is worth visiting! Soak the dried beans and cook over a slow flame. In a pan, gently fry the onion, sliced. Add the other vegetables, diced, with the exception of the cabbage, kale and beans which are added at a later point. When the vegetables have sweated out their juice, cover with hot water and then add all the cabbage and kale, shredded. Cover and simmer for an hour over medium heat. Add the cooked beans (some of them whole and some puréed), salt and pepper. Leave to simmer for another 20 minutes, stirring frequently because the beans tend to stick to the bottom of the pan. Add two or three tablespoons of tomato purée. Slice the stale bread and, in an earthenware casserole, alternate layers of bread with the soup until the bread is well impregnated. 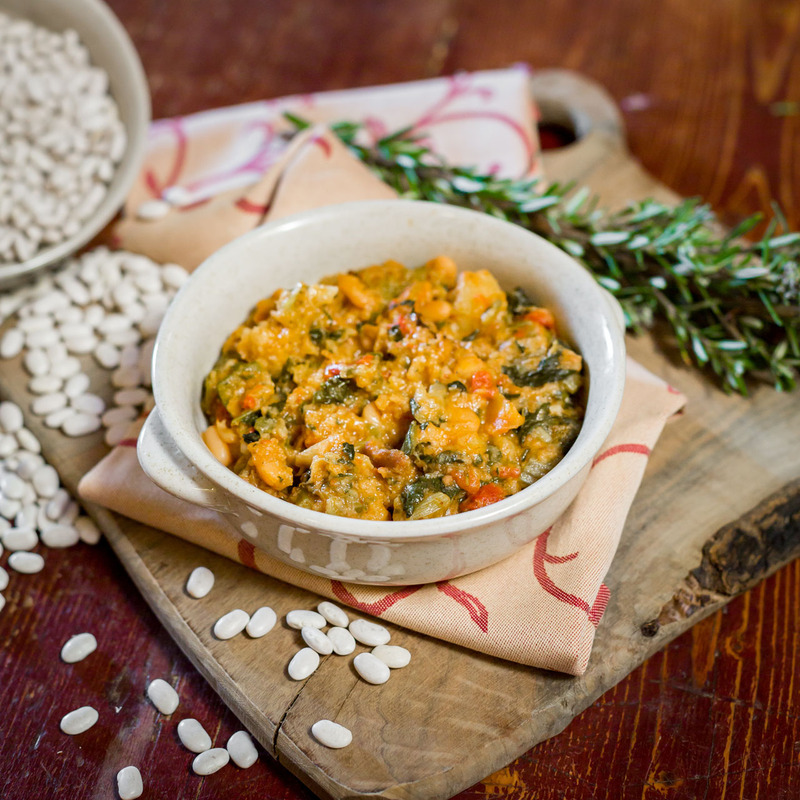 What a lot of things the famous (though rather poorly imitated) ribollita brings to mind! Few nowadays know how to cook it properly, because it requires a lot of love and time and, of course, simple but genuine ingredients. In my memory, my grandmother's dirge in particular stands out, 'Seven things does this soup do: it uses up all leftover bread and quenches the thirst, it fills up the stomach and gives the tooth something to chew on, it aids sleep and the digestion, and it makes cheeks glow'. Take the beef steak out of the refrigerator two hours beforehand, otherwise it will suffer in the cooking. Use a barbecue grill, with the charcoal glowing hot, but with no flame. Place the steak on the grill and keep over the fire for 5 minutes until a nice crust is formed. Turn it over (without piercing the meat) and repeat on the other side. The steak will remain over the fire just for the time needed to sear the surface well but keep it absolutely rare inside. Season with salt and pepper (better to use freshly ground pepper) and serve at once. Relish it accompanied by a nice green salad or cannellini beans dressed in oil. Originally know as carbonata or 'cooked over charcoal', the name 'bistecca' come from the English 'beefsteak', which, apart from the fact that it has seized the upper hand, also has an aura of internationality, making it preferable. The success of Florentine beefsteak hangs for the most part on the quality of the meat, but without doubt on the cooking too. 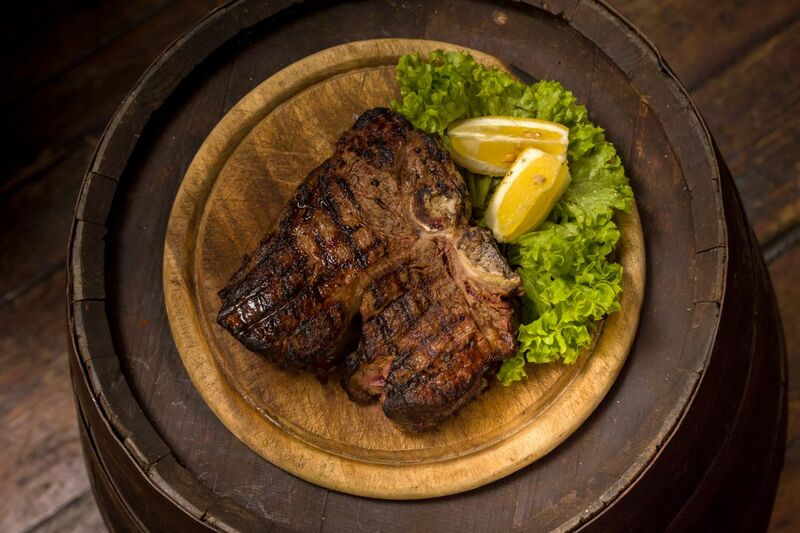 The bistecca must be an inch thick and be complete with its T bone,tenderloin and filet. Thoroughly mix all the ingredients (with the exception of the beaten egg) and knead. If necessary, add a few drops of milk, bearing in mind that the dough must be smooth but not sticky. Shape into two stick loaves 4in wide and 12in long, brush with the beaten egg and dust with sugar. Place on a baking tray lined with greaseproof of baking paper and cook in a low oven for at least an hour. When the surface is crisp and golden, remove from the oven and, using a wide bladed knife, cut the loaves obliquely into biscuits ½ in thick while they are still hot. Once cold, these biscuits can be kept for a long time in a air-tight container, so that they do not lose their fragrance. 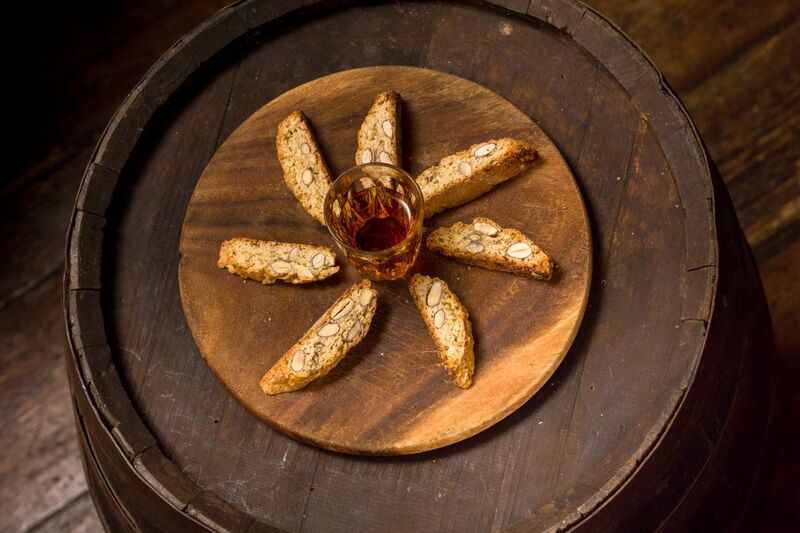 It is traditional to serve them together with a glass of vinsanto, into which they are dunked. This is the ideal recipe if you want biscuits with a balanced, pleasant flavour for relishing on any occasion. However there are some variations, such as the one where the almonds are toasted in the oven before mixing into the dough, or the one recommending a pinch of saffron to give the biscuits a bright yellow colour.